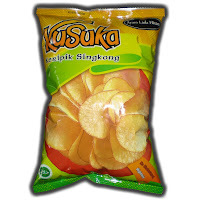 Kusuka is one of Branded Cassava chips sold on Indonesia. Wrapped in orange colored package, Kusuka offer a crispy, tasteful snack for enjoying leisure time. Cassava was picked within the same age, and then sliced with pre calculated thickness. Kusuka cassava chips are created by combining current manufacturing technology and traditional recipe. The result is the best tasting, highest quality cassava chips. Cassava, also known as yucca or manioc, is a tropical starch tuber similar to a sweet potato. For additional information, articles and news, please feel free to browse this blog. Cassava, Palm Oil, Sugar, Salt, Chicken seasoning, and other seasoning to richen the flavor. Baru lihat yg beginian. Dari namanya aza Aku Sudah Suka. Di Jakarta udah ada belom ya?